No final decision has been made on Japan's new National Stadium, the centerpiece for the 2020 Summer Olympics, but with an alternate plan judged "unrealistic," there are still no reasons to abandon the original design, an official said on June 24. Construction of the new National Stadium has run into numerous problems, including sky rocketing costs and demolition delays that have prompted speculation it might not be finished in time, as well as feuding over who will pay what for it. Education minister Hakubun Shimomura, who also holds the sports portfolio, hinted earlier this week that he might "consider" an alternative design to the one by architect Zaha Hadid, which has been criticized for its high cost and an ultra-modern design unsuited to the area around it. The new proposal, by a group headed by Pritzger Prize-winning Japanese architect Fumihiko Maki, recommended a simple, doughnut-shaped stadium without a roof to replace Hadid's futuristic design with two huge main arches, which resembles a space ship or, critics say, a bicycle helmet. 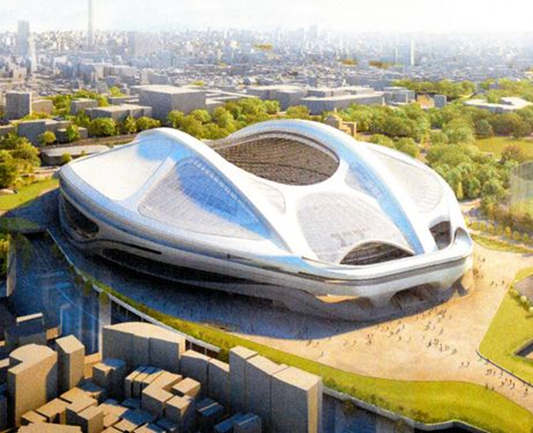 But Japanese media reports on June 24 said a decision had been made to go with Hadid's design, albeit slightly modified--and that the cost would surge to 250 billion yen ($2 billion), nearly twice the cost cited when it was chosen in an international contest as part of Tokyo's Olympic bid. An official at Japan's education ministry said that a final decision had yet to be made, although he had heard that one was likely by the start of July. Though the Olympics are not until July 2020, the stadium is also set to be used for the 2019 Rugby World Cup, which begins almost a year earlier. Hadid designed the aquatics center for the London 2012 Summer Olympics. The soaring costs have prompted several downsizing proposals, including postponing the installation of a retractable roof until after the Games and making a number of stadium seats temporary, which media reports suggest are both gaining strength.